BumbleBee™ is a precision calibrated spectrum analyzer that interfaces with the HP iPAQ® PocketPC®. The handheld receiver measures popular wireless bands: 900 MHz, 2.4 GHz, 4.9 GHz, and 5 GHz. BumbleBee™ allows the user to capture, display, and record each of these bands for network installation, coverage, and interference analysis. 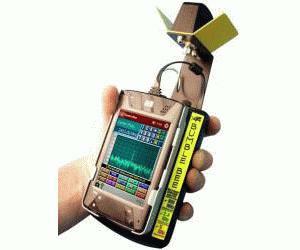 The iPAQ touch screen allows field engineers to tap on points of interest in the waveform and zoom in for further analysis. Advanced spectrum analysis features include 3 WAVEFORM TRACES, PEAK HOLD, PEAK SEARCH, and user selectable PACKET / INTERFERENCE TRIGGERS. Bumble Bee™ allows for on-the-fly switching of bands for realtime spectral analysis of many wireless standards including RFID, VoIP, 802.11(b,a,g & Bluetooth), cordless phones/video, & public safety data networks. Bumble Bee™ does the job of multiple wireless test instruments all in the palm of your hand.